Norma (Gobeli) Dickerhoof, age 79, of Alliance, passed away at 1:20 p.m., Sunday, July 15, 2018, at her home. She was born May 2, 1939, in Alliance, to Karl and Mabel (Iddings) Gobeli. A graduate of Alliance High School and Mount Union College, Norma was a school teacher for Washington Elementary School. At Mount Union College, she was a member of the Mount Union Choir, Alpha Delta Ri and Mer Phi Epsilon, which was a music honorary sorority, member of Alumni Chapter of Mec Phi Epsilon and served as president for two years. 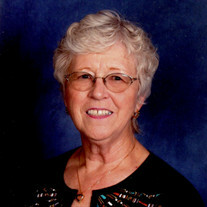 Norma was a life member of Beechwood United Methodist Church and served as organist and choir director for 30 years. She was a longtime volunteer at Canton Calvary Mission, a mission of the United Methodist Conference and served as a delegate to the East Ohio Conference at Lakeside. She also gave private piano and organ lessons and was a social worker at Sun Valley nursing Home. Her survivors include her children, Todd Dickerhoof of Alliance and Brian (Lori) Dickerhoof of Blackstock, South Carolina; seven grandchildren, Becky (Tyler) Whitton, Stephanie (Robert), Allen, Brianna (Freddie), Hanna, Joey and Tyler Dickerhoof; two step-grandsons, Louie (Celena) Skivolocke and Luke Skivolocke; seven great-grandchildren; sister, Sue (Mort) DeHoff; and numerous nieces and nephews. Her parents preceded her in death along with her husband, Dale Dickerhoof, whom she married April 14, 1962 and who died April 17, 2000; daughter, Jodene Carl who died February 25, 2012; and in-laws, Earl and Dorothy Dickerhoof. Services will be held at 11 a.m., Thursday, July 19, 2018, at Beechwood United Methodist Church. Friends may call from 6 to 8 p.m., Wednesday at Cassaday-Turkle-Christian Funeral Home and one hour prior to the service at the church on Thursday. Interment will be at Highland Memorial Park. Arrangements are by Cassaday-Turkle-Christian Funeral Home.